The middle of July in the sports world always involves three marquee events: the MLB Home Run Derby, the MLB All-Star Game and the annual ESPY Awards presented by ESPN. At the ESPYs, individuals and teams are recognized for their achievements during the past year. It’s a chance to recap the major highlights and championships that thrilled the fans as well as relive the inspirational stories from the year in sports. This year, the award went to Hall of Fame Buffalo Bills quarterback Jim Kelly, who has survived three occurrences of oral cancer within the past five years. This “Jim” may have received the honor, but it’s the award’s namesake “Jim” that set the example of what it means to never give up. 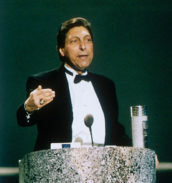 In one of the most memorable sports speeches of all time at the first-ever ESPYs on March 3, 1993, Jimmy V – aka Jim Valvano – told the audience, “Don’t give up … don’t ever give up,” as he talked about his ongoing battle with cancer while accepting the inaugural Arthur Ashe Courage and Humanitarian Award. Most notably known for winning the 1983 NCAA national championship while coaching the North Carolina State University, Raleigh, men’s basketball team, Valvano died less than two months after delivering his famous speech. He was only 47 years old. For countless athletes facing adversity, the words of Jimmy V have served as motivation to overcome the odds no matter how unlikely. Even 25 years later, these words continue to inspire. Valvano’s inspirational journey began right here in the Diocese of Brooklyn. He was born in Corona and attended St. Leo’s Elementary School. He then went on to Seaford H.S., L.I., before playing point guard from 1964-1967 at Rutgers University, Piscataway, N.J.
After a number of NCAA basketball coaching jobs around the country, he settled in at N.C. State prior to the 1980-1981 season. He led the Wolfpack to an improbable national title with a win over the heavily favored University of Houston in 1983. College basketball aficionados remember the scene vividly. With the scored tied at 52 in the waning seconds, Dereck Whittenburg’s near-half-court heave fell short of the hoop but right into the hands of teammate Lorenzo Charles, who dunked the ball to cap off the 54-52 victory. Pure bedlam ensued on the court, with the lasting image being Valvano running around the court – simply looking for someone to hug. In one of the most memorable “Cinderella” stories in collegiate basketball history, N.C. State pulled off the upset against a Houston team that featured future Naismith Hall of Famers Hakeem Olajuwon and Clyde Drexler. Valvano’s coaching career came to close in 1990. He then became a broadcaster for ESPN and ABC Sports. At age 46, he was diagnosed with adenocarcinoma, a form of glandular cancer. His speech was part of the launch of the V Foundation, whose sole goal is to achieve victory over cancer by never giving up. Since its formation 25 years ago, the foundation has awarded more than $200 million in cancer research grants nationwide as it supports cutting-edge cancer treatments. Though Valvano lost his own battle with cancer, his goal was to make sure anyone else going through a cancer fight had a chance of emerging victorious. According to the foundation, there are currently 16 million cancer survivors in the U.S., with a goal of reaching over 20 million by 2026. While progress has been made, the charitable organization is committed to doing more work to save more lives. To donate to the cause, visit www.jimmyv.org. From roaming around Queens to later roaming around the court in 1983 to find someone to hug, Valvano’s never-give-up spirit will continue to inspire athletes and those battling cancer alike. Jimmy V never gave up. And now the foundation that carries his name is never giving up in the fight against cancer.